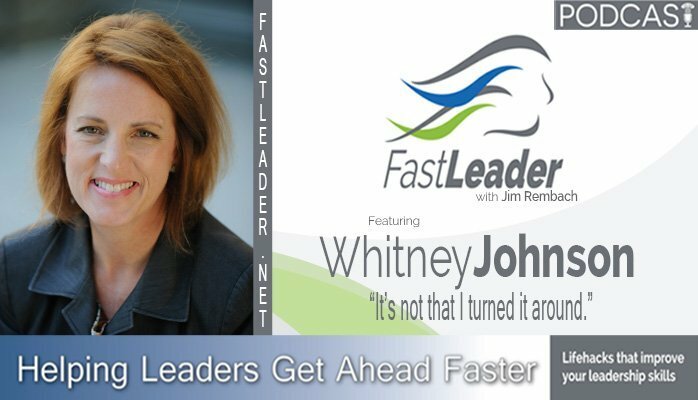 Whitney Johnson was a star analyst working on Wall Street and she had a fantastic year, except when she got the feedback from all her peers. It was really bad. So, she got a coach and turned it around. And after 15-years she’s still learning lessons from that experience while helping others to avoid the same mistakes. Whitney was born in Madrid, Spain and raised in San Jose, California. ; along with her younger sister and two younger brothers. Her parents married initially because her mother was pregnant and they then divorced when she was a senior in high school. Because her mother got married young, as the oldest child, Whitney’s job was to help make her mother happy, so achievement – winning the brass ring – became very important. Whitney studied music in high school and graduated from college with a degree in piano performance, but after graduating and moving to NYC with her husband so he could attend graduate school at Columbia, she became the primary breadwinner. And since she needed to put food on the table the brass ring was Wall Street. She started out as a secretary, took classes at night and became an investment banker. After being a banker and then equity analyst, she disrupted herself to become an entrepreneur – eventually co-founding an investment firm with Clayton Christensen at Harvard Business School. While working with him in investing in early stage companies, she had the a-ha that the theory of disruption wasn’t just about products, but about people. From there, she began to research and codify a process of personal disruption she writes about in Disrupt Yourself and Build an A-Team. She also coaches and teaches these principles all over the world. She hopes through this work to help people be less terrified to make the changes they need to make in their life and give them a structure to lean on as they make those changes. Whitney currently lives in Lexington, Virginia where her husband teaches biology at Southern Virginia University. They have two children; a son, David, who recently returned from a mission in Campinas, Brazil and is now a sophomore at Utah State, and a daughter, Miranda, who is a junior in high school and whose passion is academic team. Get a coach now, now, now, now. Everybody needs a coach. Recognize that everything is a head game – if you can change how you think and feel and not just consume information but really change your habits and hard-wiring, that going to make all the difference. How I think about myself, what I think about myself. Do not dare not to dare. I pass the test. Trust the process. I’m hungry – I want to improve. I work with a great group of people and the Headspace App.